We are excited to share we are ramping up for shipping and determining logistics to get your iBeat watch safely delivered! We wanted to provide a production update and our shipment plan as many of you have inquired via email. Our team is currently working on our second production batch of watches – all of which have been undergoing rigorous testing with outside beta users. Based on feedback, we are making some minor final changes to the watch – adjusting the clasp to make it easier for you to buckle and unbuckle and optimizing battery life. While we are in the final stages of production, discussions with our manufacturer revealed we will have to tier shipping based on units received instead of one large shipment as originally planned. That said, we will be shipping on a first-ordered, first-served basis. We expect most orders to arrive in your mailbox in July. The good news is, this date is not expected to change any further, and we are confident we will have your iBeat Heart Watch delivered by then. We apologize for the final delay. We can only hope that once you receive your watch you will be more than satisfied with the end product. You will have 30 days after receiving your iBeat Heart Watch to get a full refund if you are not satisfied with your purchase. 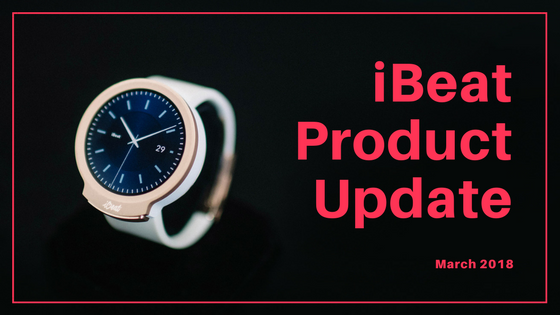 For any questions, concerns, or general feedback, please feel free to email us at support@ibeat.com, and check back here for monthly updates.